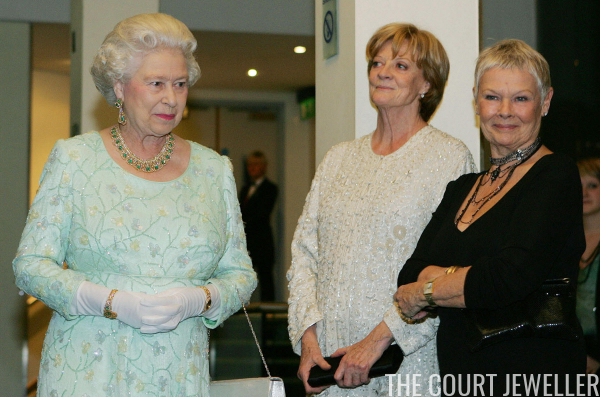 The annual Royal Film Performance may not be a glittering tiara event anymore, but the premiere does often provide us with a chance to see jewels that aren't worn frequently on other occasions. 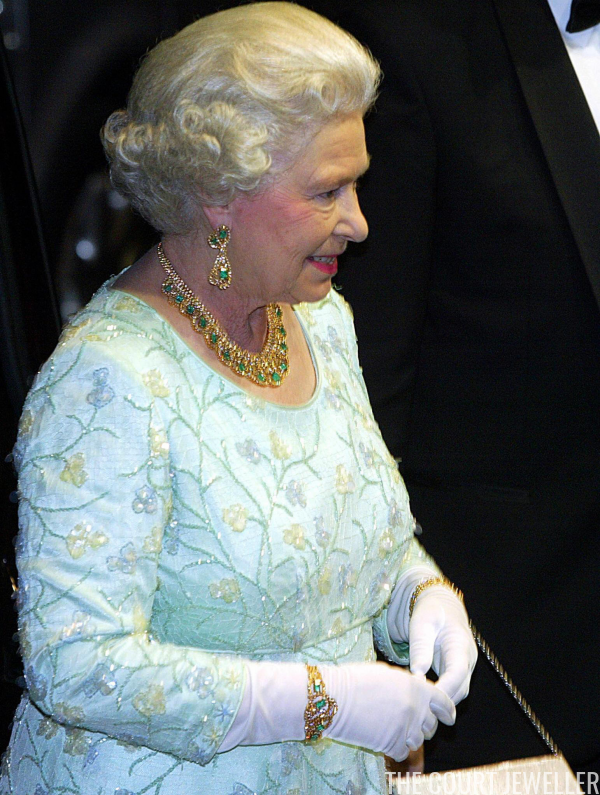 For two film performances in the early 2000s, Queen Elizabeth II wore a demi-parure of rather mysterious jewels: her Golden Emerald Suite. The set made its first public appearance in November 2000, when the Queen wore the jewels to the premiere of How the Grinch Stole Christmas. 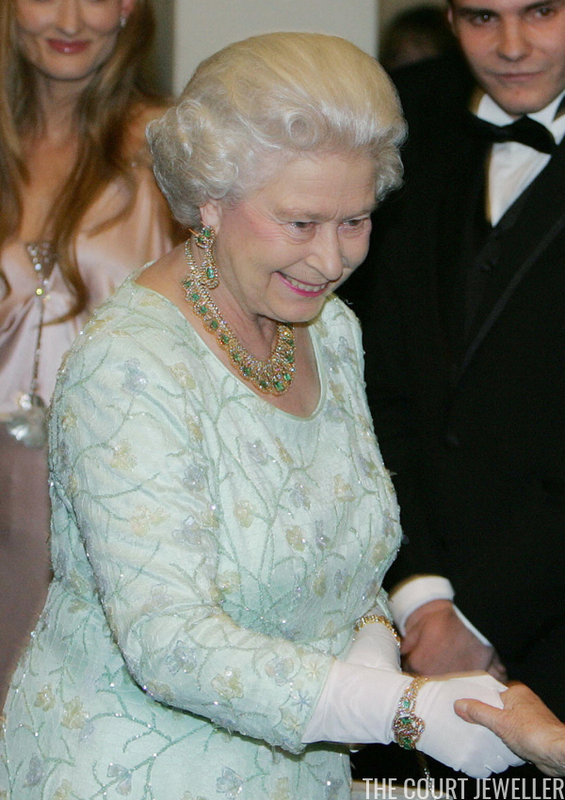 The Queen also wore the suite of jewels for the 2004 Royal Film Performance. Ladies in Lavender, starring Judi Dench and Maggie Smith, was screened at the Odeon in Leicester Square in November 2004. The unusual suite of jewels features emeralds and diamonds set in bright yellow gold. The design of the demi-parure looks to be quite modern. The set features at least three pieces: a pair of earrings, a necklace, and a bracelet. The Queen wore all three pieces for each film performance. 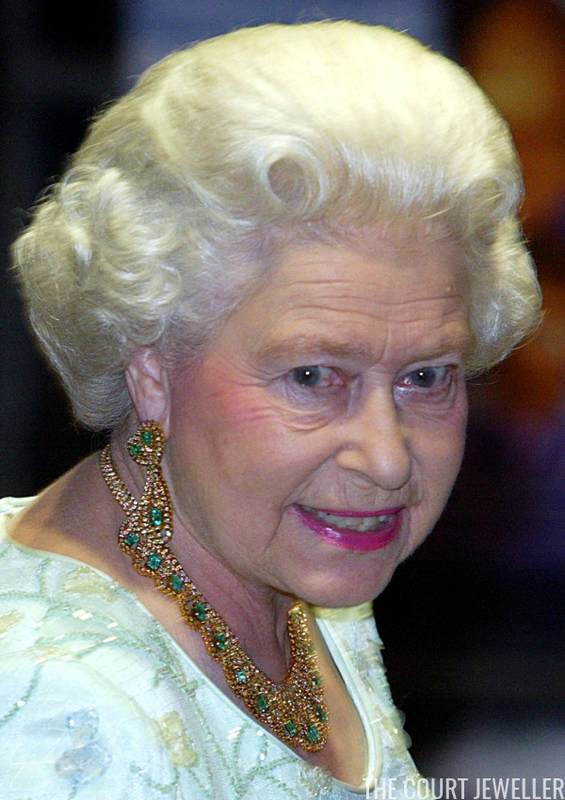 Here's a good look at the trio of coordinating jewels. We don't appear to have any information about the set's provenance, so of course many have speculated that it may have been a gift, perhaps from a foreign nation. Regardless of its origins, I'd love to see some of the younger members of the family give this one a try. Wouldn't the set look spectacular on Meghan Markle (who loves yellow gold), perhaps with a dark navy blue gown?